Ever thought about using clothing to line furniture? Either did I until recently when I had two projects back-to-back. 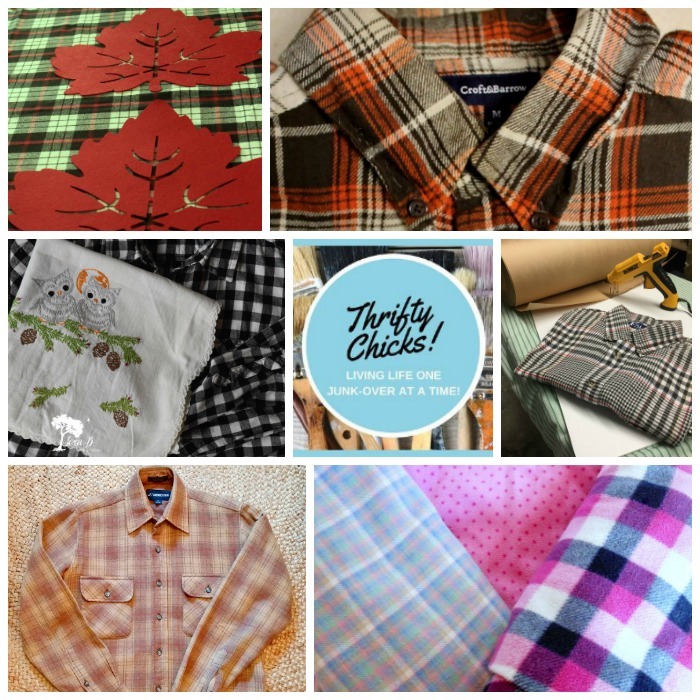 Today is our monthly Thrifty Chicks challenge and the task is to upcyle/recycle a flannel shirt. You may remember last week I turned a wooden case into a rustic trunk table? The inside of that trunk needed some tender loving care and instead of refreshing it with paint, I decided to make another trip to the Goodwill. 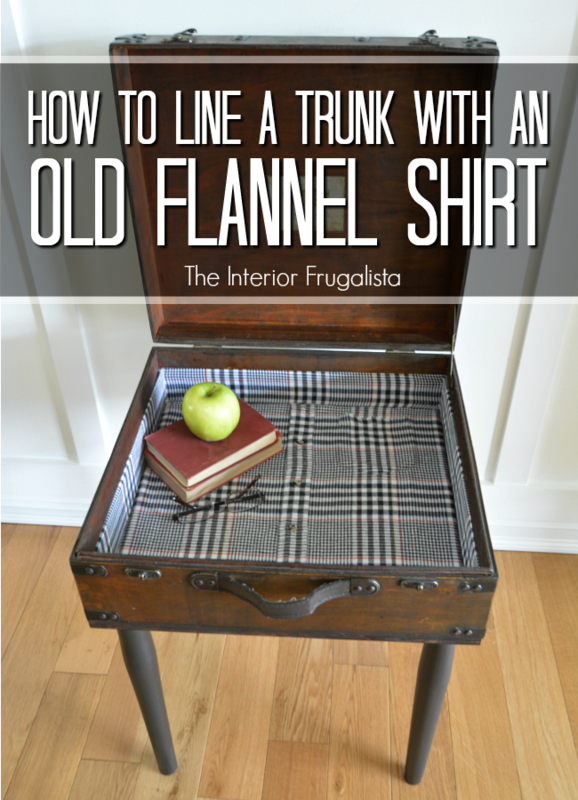 Today I'm going to show you how to line a trunk with an old flannel shirt. 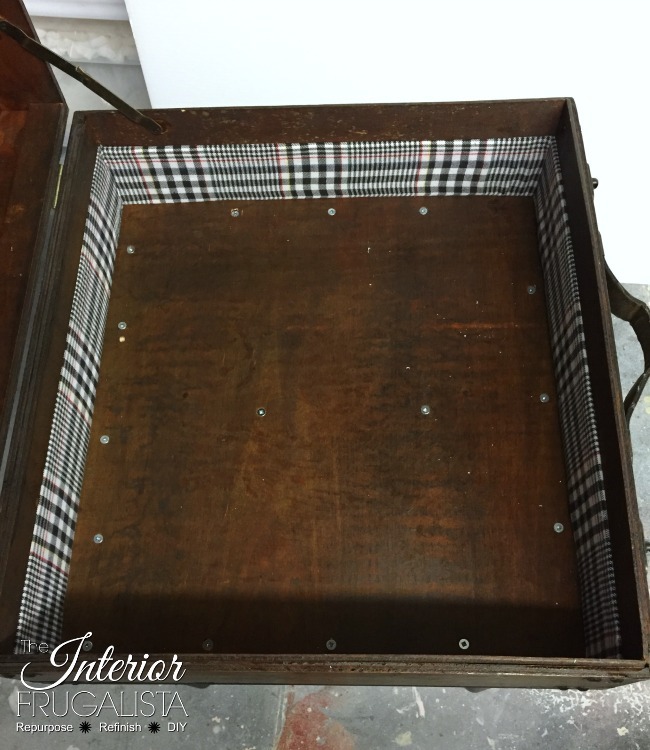 In case you missed it, here is the link to my post How To Turn A Wooden Case Into A Rustic Trunk Table. 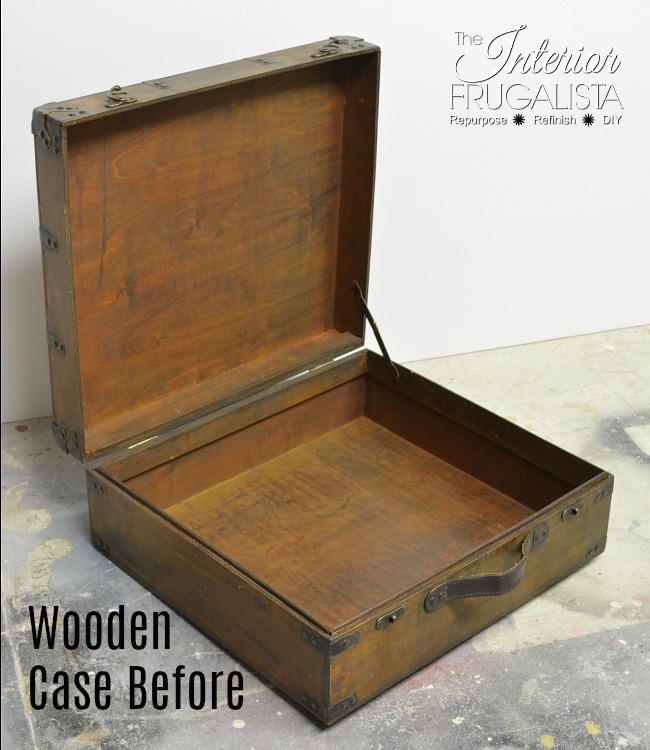 Like the exterior of the case, once I rubbed the wood with Daddy Van's Shadow Black wax, I fell in love with the patina and wanted to keep as much of it exposed as possible. I loved the French vineyard decal that I added to the front of the case to disguise the etched company logo so much, I added another to the inside of the case. 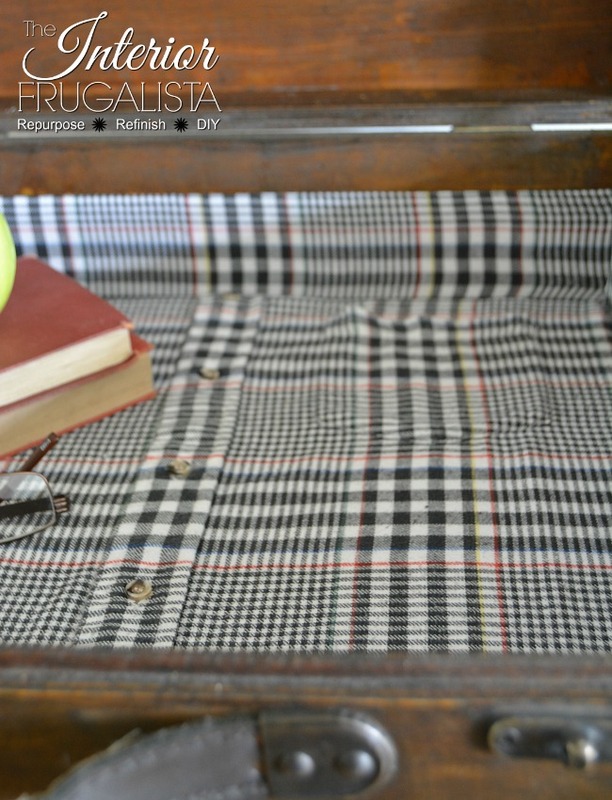 Before I get into the details of how I lined the trunk with an old flannel shirt, I should tell you a little about the Thrifty Chicks group. On the second Wednesday of every month, my creative junk loving friends and I come together to transform, upcycle or repurpose a junk find based on a theme. As I mentioned above, this month the theme is Flannel. At the end of this post, I've included a materials list for your information. To line the case I used a men's large flannel shirt. Now let's get to the meat and potatoes of how I lined the trunk. As you would any garment purchased second hand, throw it in the washing machine. I added vinegar to the rinse cycle because I'm just fussy like that. Iron shirt on the cotton setting with steam. I went the extra mile by spraying it with Lavender Water so you're surprised with a lovely scent when opening the trunk. I know lavender is a little feminine for such a masculine looking trunk but it's the only scented water I had on hand. First, do up the buttons on the shirt and cut along the side seams, around the armholes and collar. I've got plans for those two sleeves and maybe the collar but more about that in an upcoming post. 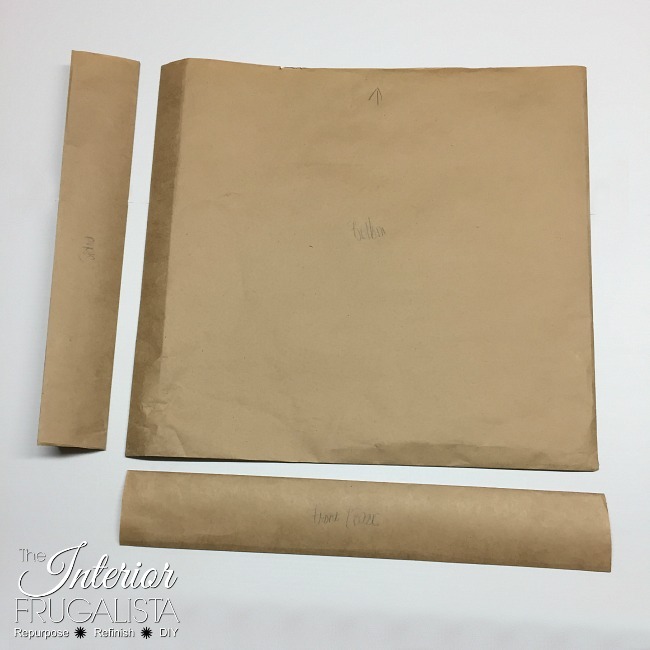 Using brown kraft paper, create a pattern for the sides and bottom of the case. Cut the paper slightly larger than you need and place against the inside of the trunk. Rub your fingers along the paper at all the joints to get an imprint of the exact measurement of each piece, folding the paper as you work. You'll notice there is wood trim around the top of the inside of the trunk. I decided to leave it natural and line beneath it with fabric. Be sure to label each of the pattern pieces. Trace the paper pattern on something rigid like corrugated plastic and carefully cut the pieces with a retractable utility knife. 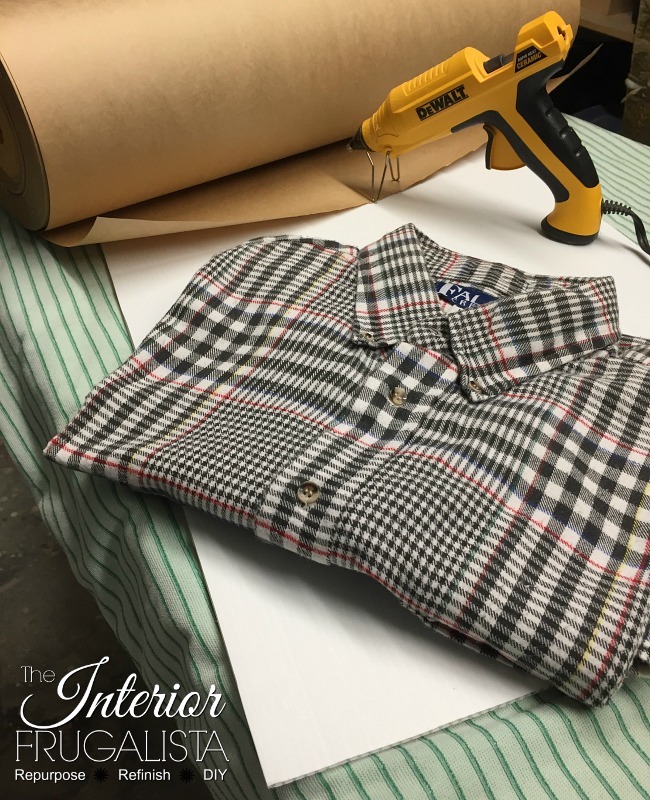 Lay the side pattern onto the BACK piece of the flannel shirt. Line it up straight with the pattern on the fabric. Note: try to match the pattern on the fabric with each piece. 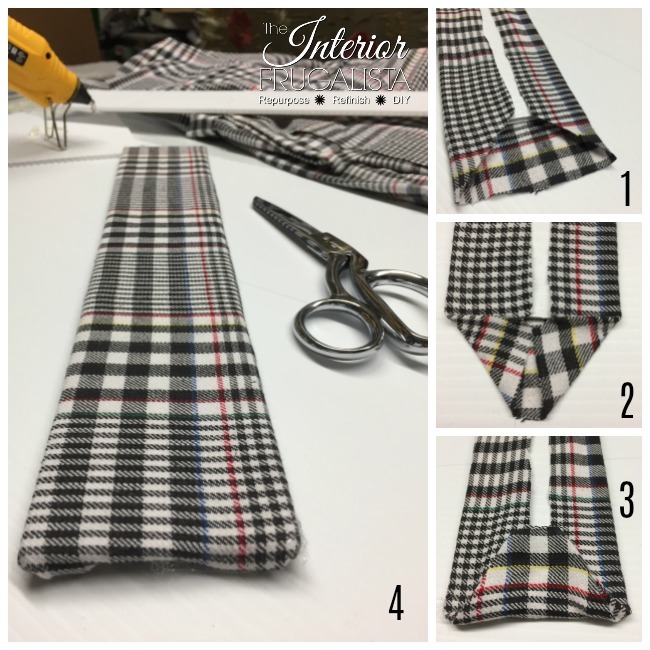 Cut the fabric approximately 2-inches larger than the pattern pieces on all four sides. Start with the back piece. Place the corrugated pattern on top of the fabric (good side facing towards the work surface). Line up the pattern on the shirt so it's straight and fold over the back. Run a bead of hot glue to secure. Repeat on the bottom, making sure the fabric is straight and taut. Fold the ends of the fabric much like wrapping a present (as pictured below). Repeat the steps above for the front piece. Remember to line up the fabric so the pattern matches the back piece. Run a bead of hot glue on the top and bottom of the back piece and place inside the trunk. Repeat for the front piece. 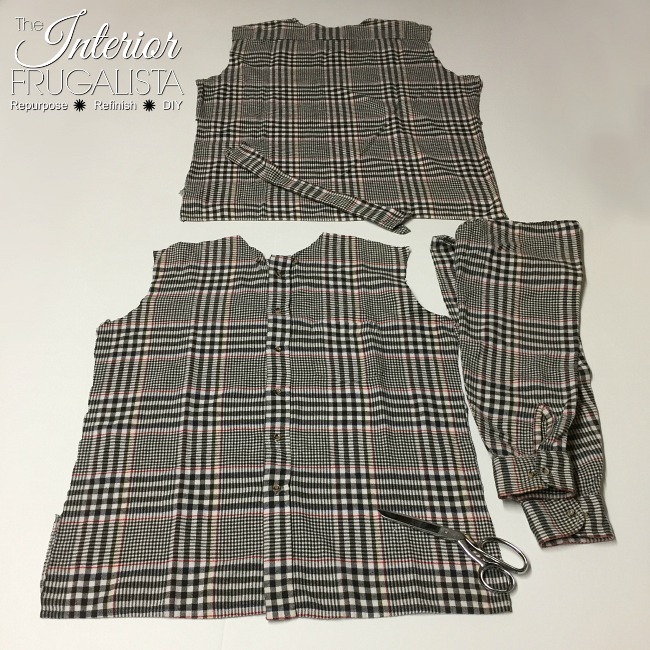 Important: Once the long pieces are installed, the corrugated side pattern pieces will most likely have to be trimmed to accommodate the bulk of the fabric. 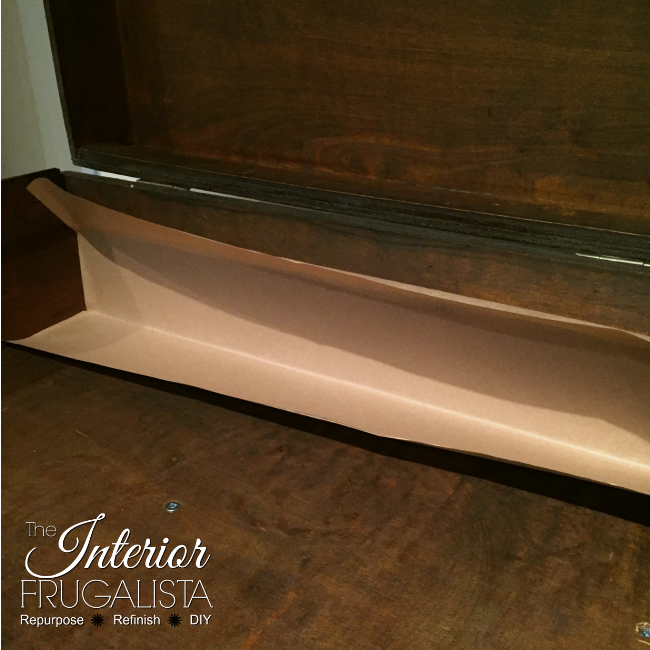 Trim the side pieces with the retractable utility knife in small increments until you get the perfect fit. 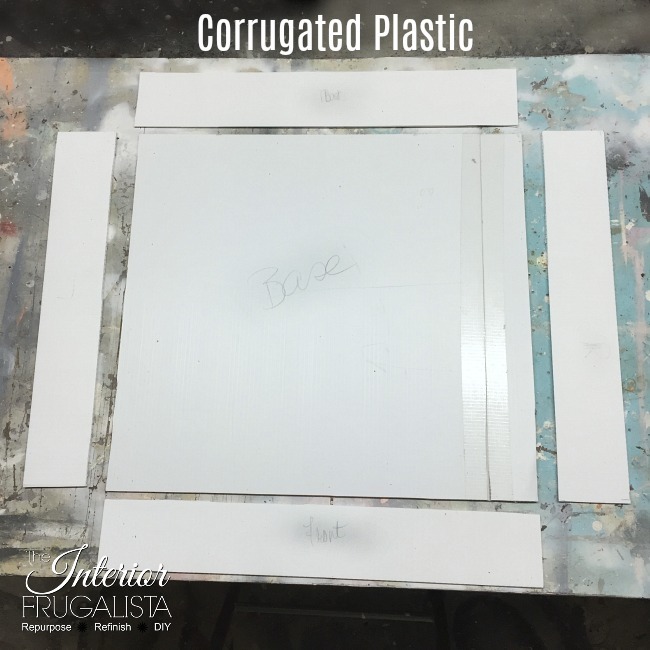 Like in Step 8, the bottom corrugated plastic pattern piece will have to be trimmed both vertically and horizontally to accommodate the bulk fabric. Cut it with the retractable utility knife in small increments until you get the perfect fit. Hot glue the buttonhole piece closed (as pictured below). Center the button holes on the corrugated bottom piece and add a dab of hot glue to hold in place. Flip it over and finish gluing the top of fabric in place. Make sure the pattern is straight and taut before gluing. Fold and glue the sides like in Step 7. Push the bottom in place. It should be a tight enough that you won't need to glue in place. 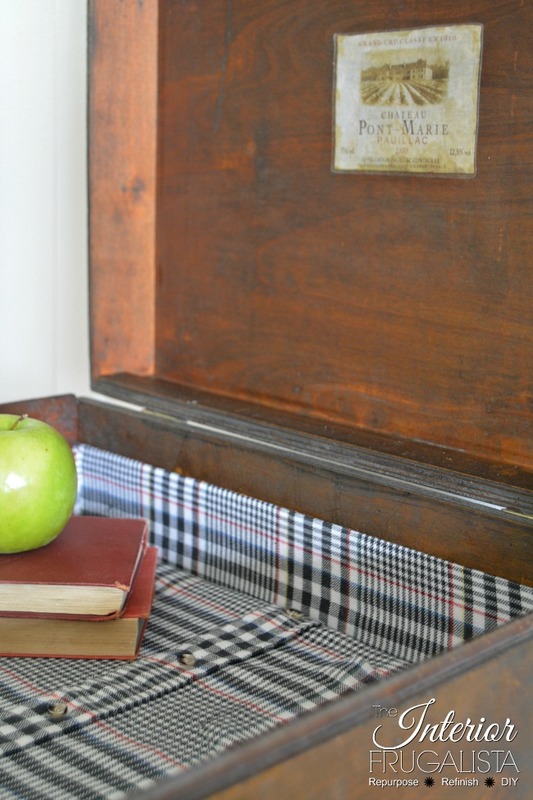 In case you missed it, last month's Thrifty Chicks challenge was Chalkboard. I repurposed two cabinet doors into a Chalkboard Message Center to go with the Student Desk That Went All Glam that I recently refinished for a girl's room. 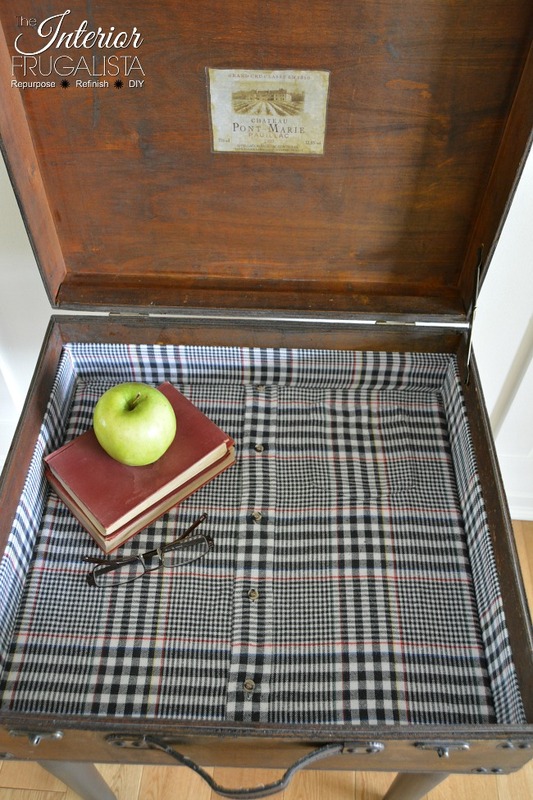 If you like the idea of lining a trunk or perhaps a suitcase or furniture drawer with a flannel shirt, please share it with a friend and/or save it on Pinterest. 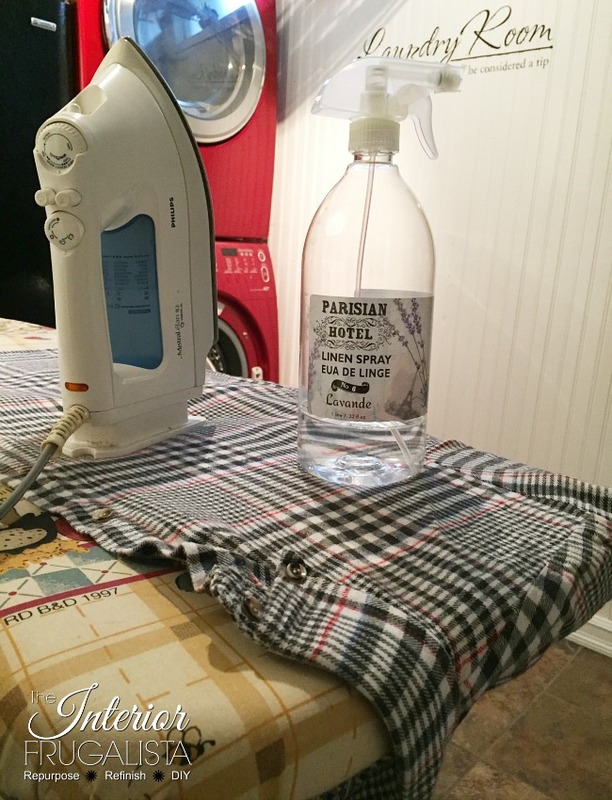 Please join me in visiting my friend's blogs to see what they did with their flannel shirts.